The record culture made it possible to enjoy the music every day developed rapidly and enriched in our life. The music itself and also it’s jacket design keep fascinating people until now. “Jakegai“ means that people fascinated by a jacket design buy the record was created, and one can guess that jacket design strongly attracts people. 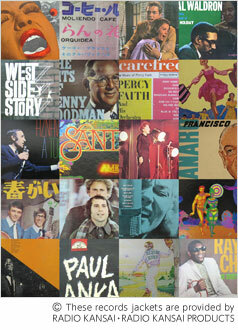 This exhibition displays about 200 record jackets that Radio KANSAI possess. Please enjoy the world of jacket design. We displays about 20 works from our collections made through 1950-1970’s. This exhibition is held simultaneously with Jacket Design of the showa era, (1950-1970 ’ s) that shows the record culture from a musical perspective and we highlights 20 works from an artistic point of view. This is the second exhitibion of our collection after Yoshie NAKATA. The exhibitions include the avant-garde art group called “Gutai Art Association (Gutai)” established in 1954, painters and sculptors associated with Ashiya.